Image caption AET said the school's academic performance was "very weak"
An Isle of Wight academy is to be merged with a primary school to create a new all-through, council-run school. 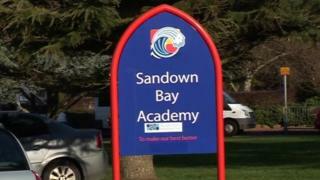 The Department for Education has given conditional, in-principle, approval for the closure of Sandown Bay Academy. Academies Enterprise Trust, which runs the school, announced its proposed closure in May, blaming a decrease in pupil numbers for falling income. Isle of Wight Council said a new school would allow it to "transform secondary outcomes" on the island. AET, which also runs Ryde Academy, previously said income at Sandown Bay Academy had dropped by £5m in five years because of a "rapid fall" in pupil numbers. It also described the school's academic performance as "very weak" and said it lacked teachers and resources. Isle of Wight children's services councillor Paul Brading said: "A tremendous amount of work has taken place to get us to this position. There is much more to do though as we put our plans together towards creating the all through school." Mr Brading said a formal consultation over the expansion of The Bay Primary would take place before Christmas with a final decision due soon afterwards. November 2014 - Ofsted rating upgraded to "requires improvement"
March 2017 - AET reduces a £850,000 savings target to less than £250,000 "following discussions with the head teacher"
May 2017 - Isle of Wight Council votes to ask the government to oust AET "off the island altogether"